The festival pass will get you into all the shows and afterparties during NYC Popfest! Please make sure you include your full name when purchasing! IMPORTANT -- THERE ARE NO PHYSICAL PASSES. YOU WILL NOT RECEIVE ANYTHING IN THE MAIL AND THERE WILL BE NO BADGES/PASSES FOR YOU TO PICK UP DURING THE FESTIVAL. All you need to do is bring your ID to each show, and your name will be on the will call list! Passes are non-refundable and non-transferrable. Make sure to arrive to the venues early as admission is subject to venue capacity! 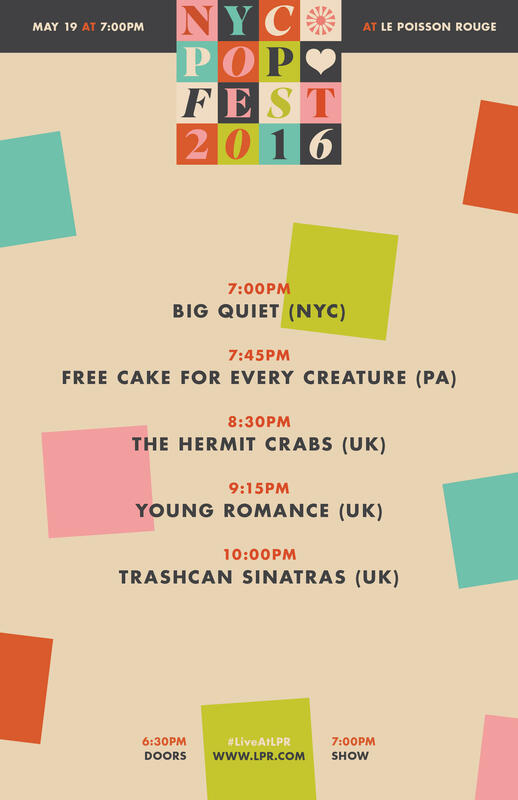 See you at NYC Popfest! DJs Dr Maz, Kevington, and Miss Modular are reuniting to celebrate Popfest’s 10th Anniversary! For more than a decade, Mondo was New York City's most celebrated indie dance party. Called "the gold standard for New York indiepop" by BrooklynBased, Mondo was created in 2004 by DJ Miss Modular and soon became a trio with the additions of DJs Kevington and Dr. Maz. Over the years, the Mondo DJs have cultivated a rare blend of brand new and vintage indie pop, indie rock, Britpop, post punk, 60s girl groups, and classic alternative & New Wave all selected to hit music enthusiasts' sweet spots and give people a chance to dance to songs they never thought they'd hear played outside of their living room dancing sessions. Through the years, Mondo has had residencies at Luke & Leroy, Don Hill's, and at Cameo Gallery in Williamsburg. Over the years, they’ve hosted live sets from the Radio Dept, the Pains of Being Pure at Heart, the Drums and so many more. 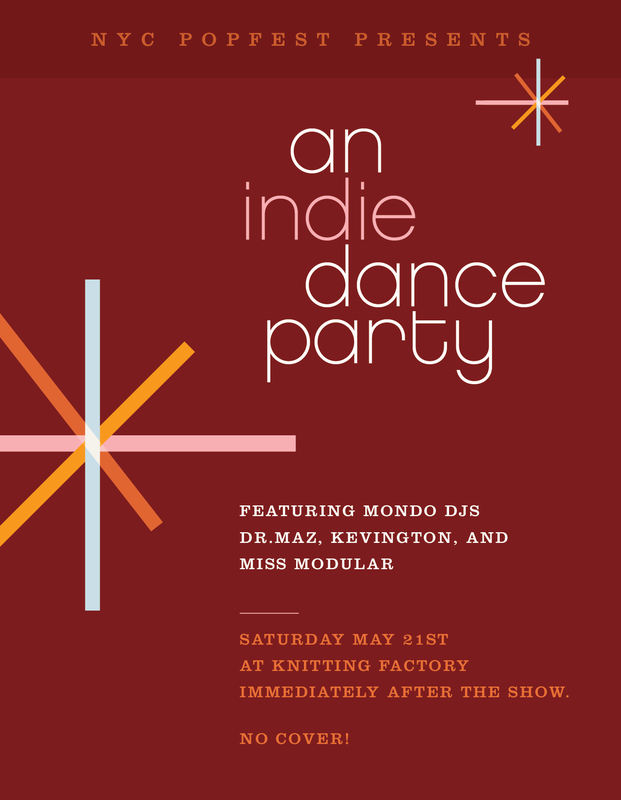 They've had guest DJ sets from John Cameron Mitchell, Au Revoir Simone, Imperial Teen as well as from a handful of other indie devotees from near and far. They’ve thrown Mondo special events all over the city from the Brooklyn Museum to Rooftop Films with Jarvis Cocker to Le Poisson Rouge. Wherever Mondo goes though, the constant is always the DJs' insistence on creating a carefree scene shaped by brilliant tunes and the rule that our dance floor is for everyone. In September 2015, after an 11 year run, Mondo threw it's last official party. But now they will reunite to celebrate Popfest's 10th Anniversary! Ten years in the making, Big Gold Dream, the exhaustive documentary on the Edinburgh and Glasgow Post-Punk scene premiered at the 2015 Edinburgh International Film Festival, winning the Audience Award. The BFI’s Sight and Sound magazine also listed Big Gold Dream as one of its top films of 2015. A tale never before told; the film’s focus is on trail-blazing Independent record label Fast Product, and its subsidiaries Pop Aural and Earcom. Featuring candid interviews with those behind the scenes, those on the periphery and the main-players - Rezillos, Scars, Fire Engines, Josef K, Dirty Reds, Flowers, Thursdays, Boots For Dancing, Associates, The Twin-Sets, Joy Division and The Human League, and of course the city itself - Edinburgh in the late 1970’s is painted in all its dark and gritty realism.